If there’s something that’s harder to get college students to agree on other than toppings on a free pizza, it’s their favorite musical artists. Internet streaming has opened up millions of song possibilities. But with each tap on a smartphone app, students are making a choice – and that choice is most likely their favorite artists. So who are they listening to? Are certain artists better represented in different cities housing universities? We looked at over 54,000 tweets to see which musicians strike a chord with the citizens of these college towns as well as who might just sell out that on-campus auditorium in a specific city. Music plays an important part in providing a soundtrack for an academic career. Though based on mentions in these college towns, some artists are more likely than others to play as the backing track in the movie of our lives. His legendary work, from “Purple Rain” to the Super Bowl XLI halftime show, appears to have a timeless popularity. More than 16% of the mentions contained references to him. 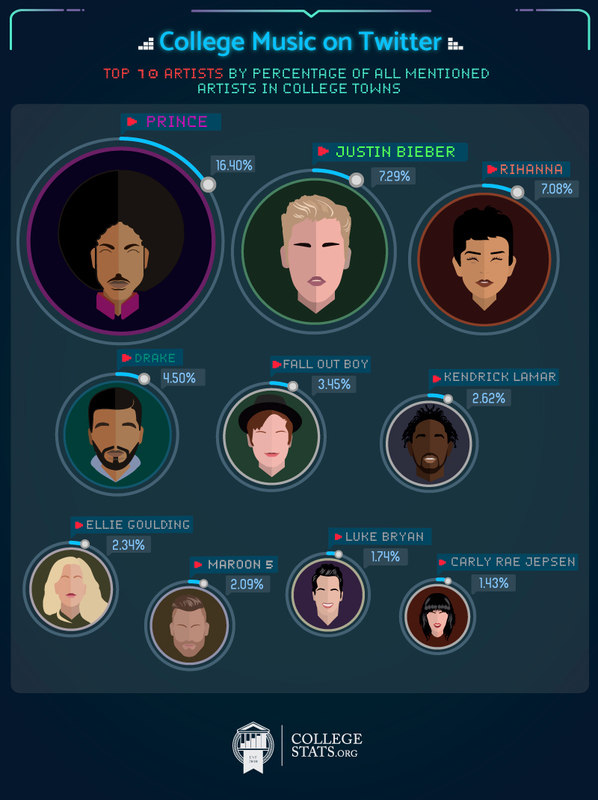 Coming in right behind “The Artist Formerly Known As …” with over 7% of the tweets each are two relevantly recent musical talents: Justin Bieber and Rihanna. Drake, Fall Out Boy, Kendrick Lamar, Ellie Goulding, Maroon 5, Luke Bryan, and Carly Rae Jepsen round out the top 10. If commanding the No. 1 spot overall wasn’t enough, Prince owns the online conversation in several cities when stacked up against other musical artists. In his home city of Minneapolis, Minnesota, over 82% of all mention of musical artists are about the man behind the Billboard-topping “When Doves Cry,” “Raspberry Beret,” and “Let’s Go Crazy.” But the love for Prince doesn’t just reside in the Twin Cities; he’s talked about in college towns across the United States. Honolulu, Hawaii – home to the University of Hawaiʻi at Mānoa and its nearly 20,000 students – houses not only a tropical paradise but a populace that loves to share tweets and thoughts about Prince. Over 40% of their collected tweets speak to a love affair with the multi-instrument playing musical magician. 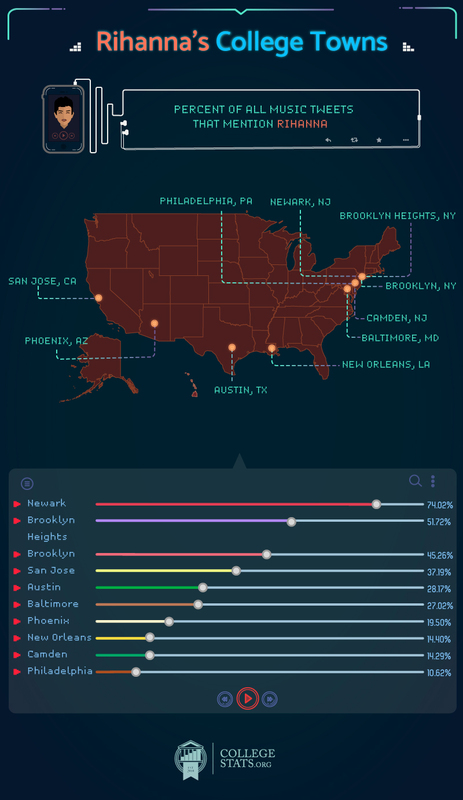 Two large metropolitan areas, Jersey City (33%) and the Bronx (29%), also rank in the top 10. It seems like Rihanna’s fans aren’t finding her music in hopeless places. Those college cities where the Barbadian songstress dominates are found all around the United States. Newark, New Jersey – home to Rutgers University and their 67,000 Scarlet Knights – can’t stop talking about Rihanna. Over 74% of the tweets in this college town mentioning musicians are centered on Riri and her discography, which is filled with collaborations with artists such as Drake, Eminem, Jay-Z, Kanye West, Nicki Minaj, and David Guetta. Rihanna may not be a native, but she’s definitely on New Yorkers’ minds. Brooklyn Heights (51%) and Brooklyn (45%) take second and third place. These major cities, which also double as large college towns, can’t stop talking about the Caribbean Queen. She’s also a favorite in San Jose, CA; Austin, TX; and Phoenix, AZ. Justin Bieber, the Canadian singer-songwriter was “Ushered” into a fame that began with his YouTube videos. And he earns plenty of love and buzz in the United States. The boy-turned-man-before-our-eyes behind “Baby,” commands the adoration of 83 million followers on Twitter and the love of Cleveland, OH. Cleveland – home to Cleveland State University and its over 17,000 students – engages in the most conversations around Justin and would most certainly be considered “true Beliebers.” Also jockeying for his love are the citizens of Louisville, Kentucky (54%), as well as Kansas City, Missouri (51%); they come in second and third respectively. 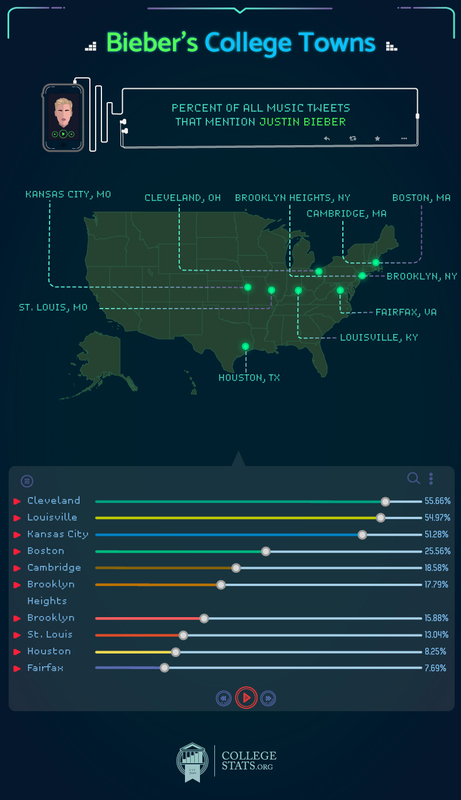 There are other major college cities in the top 10, such as Houston, TX; Boston, MA; and Brooklyn, NY; the people there aren’t “Sorry” that Bieber dominates the Twitter conversations in their neighborhoods. Absent from the list are any cities in the Western United States. Perhaps it’s time to talk to your tour manager about California, Oregon, and Washington State, Justin. Canada’s latest import isn’t more maple syrup but Toronto native Drake and his smooth R&B and hip-hop. 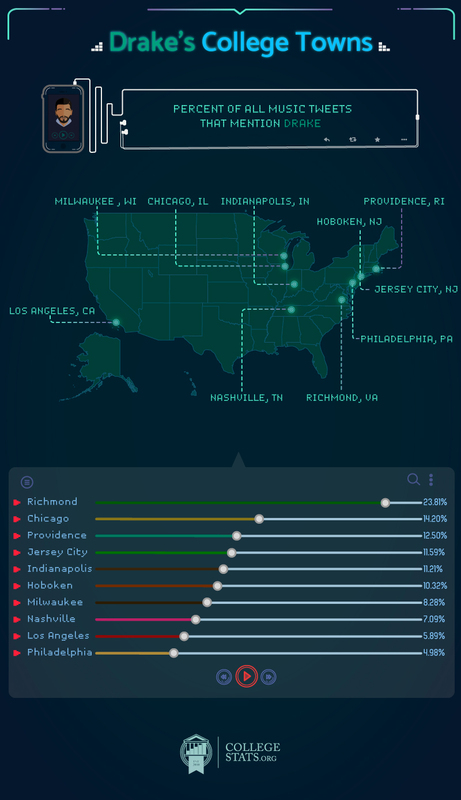 While he only ranks fourth overall in tweets mentioning artists in college towns, “Drizzy’s” music connects with plenty of cities and their populations in a meaningful way. Nowhere is this more evident than Richmond, Virginia. Schools such as Virginia Commonwealth University (31,242 students) contain plenty of students who may share their thoughts via Twitter on his album “Views” or one of his hits, “Started From the Bottom.” Over 23% of the tweets mentioning music coming out of this city focused on Drake. No other city talks about Drake that much, but a few others still show their love for the man behind OVO Sound. 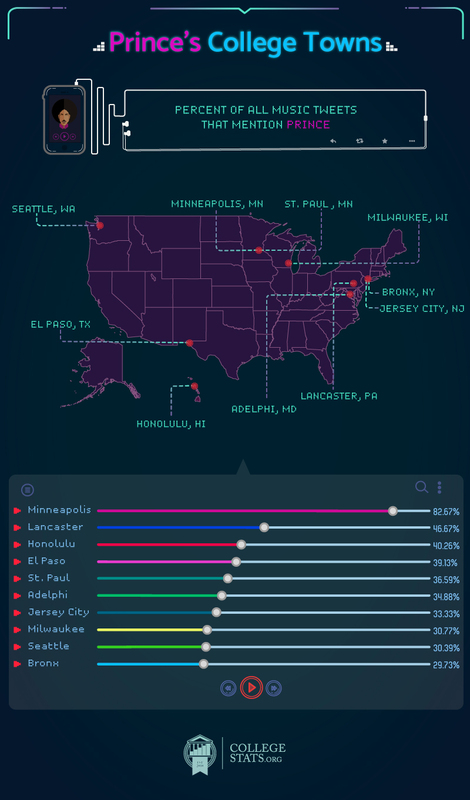 Chicago, IL; Providence, RI; Jersey City, NJ; Indianapolis, IN; and Hoboken, NJ all boast double-digit percentages for the mind behind “If You’re Reading This It’s Too Late.” He needs to show Los Angeles, California, and its students some love. There, he only registered with ownership of just under 6% of overall mentions. The volume of tweets and their focus on several larger artists speak to the power of their sound and musical messages. Whether you’re heading to school out West or enrolling in upstate New York, there won’t be a shortage of conversations on campus or online about some of the world’s most popular musicians. To find stats on your same-band-loving brethren and other colleges, head to CollegeStats.org. The artists we searched for were chosen by their presence on the Billboard most popular artists of 2016. For each artist we looked at, we took a sample of the tweets to see that the majority matched the context of the artist in question. High-ranking artists mentioned with different meanings and contexts were excluded. These artists include Flo Rida, Future, The Game, LMFAO, Pink, Pitbull, and Train. When looking at Prince tweets, we concluded from the sample that the vast majority of tweets pulled did in fact mention the artist. College towns were chosen by including only four-year public and private schools according to the Integrated Postsecondary Education Data System (IPEDS).